Am I boring my dog? That's what author Edie Jarolim wondered when she wrote the book. If you've never had a dog before, the following interview offers tips on choosing the best dog for your family. 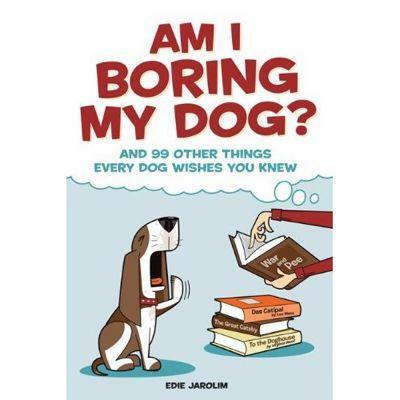 Edie Jarolim is the author of the humorous but insightful book, Am I Boring My Dog? And 99 Other Things Every Dog Wishes You Knew. Edie grew up never owning a dog until she became an adult. This witty travel writer never dreamed of having a dog because she felt incapable until a fellow writer and dog lover convinced her to take the plunge. Am I Boring My Dog? is an amazingly entertaining book, but it goes beyond being a fun read. It is an indispensable resource for other new dog owners or people who still aren't quite sure they are cut out for the task of caring for a four-legged friend. Enjoy the following interview and see what to consider before choosing a dog of your own for the first time. 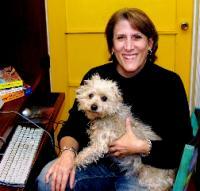 LoveToKnow (LTK): Edie, since you are a travel writer, why did you decide to write a book about dogs? Edie Jarolim (EJ): It was a gradual transition from primarily being a travel writer to primarily being a dog writer, although several events hastened the progress of that shift. Travel became more of a hassle after 9/11, so there was a bit of burn out to begin with. After 2004, when I adopted my first (and still only) dog Frankie, I discovered that I didn't enjoy leaving my little momma's boy at home when I went on long trips. In late 2007, Frankie developed diabetes, and that made travel with him and leaving him at home with a caretaker more difficult. He requires two insulin shots a day at regular intervals, monitoring of glucose levels, special meals, etc. My research into canine diabetes led me to query Your Dog, the newsletter of Cummings Veterinary School at Tufts University, to see if they wanted a story about the disease. I began writing regularly for the publication, although I didn't cover diabetes for them until recently (the story is in the November 2009 copy of Your Dog). This in turn led me to contact an editor I knew at Alpha Books, that had published my Complete Idiot's Travel Guide to Mexico's Beach Resorts, about doing a dog book... and the rest, as they say, is history. LTK: What holds potential new dog owners back from getting their first dog? EJ: I can't speak for all new dog owners, but I think it's generally a sense of insecurity that comes with a fear of the unknown, especially if you didn't grow up with dogs, which was my experience. Getting a dog is a big responsibility and not everyone feels they can handle it. In one respect, it's good that people don't just jump in with eyes closed. However, there's a point at which the fear of the unknown keeps you from experiencing new and wonderful things. LTK: What are the pros and cons of adopting a rescue dog? EJ: I can't think of many down sides of adopting a rescue dog. A lot of people don't realize that they don't have to forgo their interest in a specific breed when they rescue a dog; approximately one out of every four dogs in shelters are purebreds. In theory, a negative is not knowing the dog's background, but there are many unknowns in the upbringing of every dog, including purebreds raised in a single home from the time they are puppies. It's impossible to control all the circumstances of raising a dog. There are far greater problems with dogs bought in pet stores (that tend to come from puppy mills) than with those adopted from shelters. Pet store/puppy mill dogs generally have socialization and health issues, while many shelter dogs come from good, stable homes. Owners have to give up dogs for a variety of reasons, often economic ones, so don't assume rescue dogs will have more behavior problems than other dogs. It's true that you won't find as many puppies as mature dogs at shelters, but to me getting a slightly more mature dog can be a bonus, especially for first time owners. They're far mellower than puppies, and in most cases won't need to be house trained. Get a dog from a shelter and you'll have access to low cost neutering and spaying, as well as to the good-hearted vets who volunteer there. And think of all the moral superiority points or, to put a better spin on it, good karma you get from being a rescuer. LTK: What things should potential dog owners consider before getting their first dog? EJ: They should consider such factors as the size of their home, how much time they have to exercise a dog, and what they're looking for in a dog. Is it primarily couch companionship? Jogging partnership? If so, they should do a lot of research into breeds that will meet those goals. That doesn't preclude rescue of mixed breeds, incidentally; many shelters have temperament testers. For those that don't, you can take a trainer along to help assess the suitability of a potential adoptee. Size is also a factor as far as economics are concerned; not all large breeds dogs require a lot of exercise or even space, but they all require a lot of food. It stands to reason that you''re going to spend a lot more money on a large dog than you will on a small dog. And then there's shedding or lack thereof. Some people have allergies, including to vacuuming. LTK: How should someone prepare for getting their first dog? EJ: There's psychological preparation and there's physical preparation. For the former, do what you can to relax; this might be a good time to go to a few yoga classes. You and your dog are both going to be under a bit of stress while you get to know each other. Accepting that fact makes it easier to deal with. Physical preparation is a bit more clear cut. You need to cover the basics: bedding, collar and ID tag, as well as leash, food, safe toys, dog bowls and crate. Don't spend much money on any of these items; bedding can be some old, clean towels, for example. You'll have plenty of time to find out which food and toys suit your dog best, and you'll discover most of your friends will now have a new focus for their gifts to you - dog items. Let them shell out for the expensive stuff. Also, keep a list of emergency contacts on hand including friends who know about dogs. LTK: What tips can you share to make bringing home that first dog a better experience? EJ: Plan to stay home for a few days, and give yourself and your dog time to get used to each other. Don't let your dog become overwhelmed, including by friendly members of your family; let everyone introduce themselves slowly, one at a time. I've mentioned setting aside a contained space; this is especially important for rescue dogs that may be used to being confined. Don't get hung up on the details. You're not going to be perfect, and neither is your dog. Assume you're going to make mistakes. Dogs are very forgiving (remember, you're the source of their food and shelter). And this may seem obvious, but it's essential to remember that dogs will be dogs. They'll do doggy stuff that has nothing to do with you, including sniffing, digging, barking and chewing. This is where anthropomorphism can be a problem. Don't take things that your dog does personally as an affront. Being sentient doesn't mean being capable of such human behavior as vindictiveness. Your dog is not trying to provoke you when she chews your shoes; leather is tasty to her (that's why rawhide chews are popular). If you leave snacks lying around, why wouldn't she indulge in them? EJ: That training is essential to having a good relationship with your dog. At its best, training is all about communicating, making clear to your dog what's expected of him and, in turn, understanding what he's trying to tell you. It has nothing to do with rote indoctrination and should not involve physical coercion, in spite of what's advocated on some popular TV shows. You can be firm and be a leader without harming your dog. And you can - and should - have fun together. Training should begin as early as possible - 12 weeks with puppies - and you should look for someone reputable who uses "dog friendly" techniques you can feel comfortable with. These techniques can and do vary, but you can be sure they won't involve harmful props like shock collars or choke collars. The Association of Pet Dog Trainers (APDT) is a good place to begin a search. In all cases, trust your gut. If something doesn't feel right, and especially if your dog seems distressed, cut your losses and find someone else. LoveToKnow would like to thank Edie Jarolim for taking the time for this choosing a dog interview for first timers. If you are considering a puppy for the holidays for yourself or a loved one, please do your research and choose wisely. Be sure part of your research is Am I Boring My Dog, available through Amazon.com. You'll be sure to learn something new while you read it and have fun at the same time.